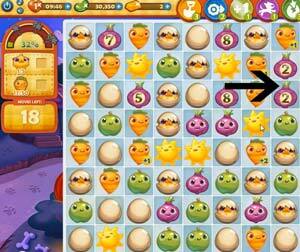 These Farm Heroes level 247 cheats and tips will help you beat level 247 of Farm Heroes. 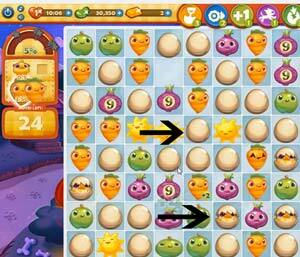 The objective of Farm Heroes level 247 is to collect five chicks and 50 carrots in 25 moves. While trying to collect resources, do not lose track of the bombs. Before you know it the timers may be down to one or two moves. Keep track of each bomb to make sure you do not let it blow up. If you have no way to get rid of the bomb, use the shovel to clear it. In this level, boosters may be necessary. The shovel booster can help you to remove a resource that is in your way. It can also help you hatch one of the chicks eggs to make a match. 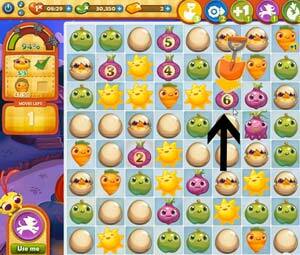 If you are running out of moves and need to collect more carrots, you can use the dog to remove all of them from the board.